Here is a handy way to add a touch of class to your powder horn and increase durability and ease of use all at once. The brass pouring spout attaches permanently to the horn. 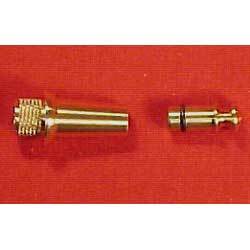 The solid brass plug for the spout is equipped with a rubber o-ring to createa snug, water-tight fit.